Gentle Heather came in with her kittens a few months ago. Of course the kittens were all adopted out immediately, but Heather, just a baby herself at under a year old, was overlooked time after time. Until now! New mom Barbara came to our kitten adoption event last Saturday, but wisely decided to adopt an adult cat to be a companion to her cat Nicky. 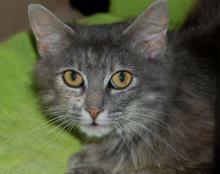 We applaud Barbara for making that decision since adult and senior cats are so often overlooked in the shelters. It appears Barbara made the right decision for Nicky, because he is already doting on his new love. HEATHER'S journey to New Milford took longer than usual, so she was a little overwhelmed on arrival. After some initial cuddling, she decided to take a break behind the kitchen cabinets. Nicky knew she was probably hungry, so he very thoughtfully pushed her food bowl under the cabinet with his paw so she could eat without coming out! Aww Nicky, you are such a sweetie! We know you and your mom are going to take good care of our sweet Heather.